It has been mentioned a few times on this blog that there was a great appetite from the public for what we would now consider very sentimental images. This sentimentality can be seen in many postcards we have looked at over the years and also in the choice of prints people placed on the walls of their homes. Tonight we have one of the largest images we have seen on the blog, with this framed World War One print called ‘The Return’: Sadly the glass is missing from this frame, however I am endeavouring to find a replacement so it can be hung on the wall. It is a particularly large piece, with the print measuring about 18”x24” and depicts a soldier returning from war. He is dressed in his uniform and has a bandage around his head, and a crutch under one arm indicating some wound or other: His wife and daughter hold their arms up longingly to their wounded hero: The wife and child are well dressed, but not wealthy- the artist conveying an image of a respectable working family. The hearth roaring behind them adds to the air of domestic respectability: Above the mantelpiece the faint outline of a portrait of the soldier, in uniform, and his wife hangs proudly in the central position within the room: The image helps get over to the viewer what the artist felt was the purpose of the Great War- respectable, decent and honest the soldier has been away serving his King and country and protecting the hearth and home. His family are proud of his service and keen to welcome him back into their lives now he has returned; literally with outstretched arms. This print is without doubt a piece of propaganda, and not a particularly subtle one at that. It did however tap into the feelings of many at the start of the Great War- people were proud of their fathers, brothers and sons leaving to join the army and it was seen as a war to protect English values from the dangers of the ‘Hun’. The popular view today of the First World War as a pointless slaughter was not the view of many during the war and indeed for decades afterwards and images like this, though not high art, are just as reflective of the mood of the era as the large canvases of battles painted by official war artists. These prints were published with periodicals of the day, or sold as cheap posters by publishers. Some chose to have them framed such as this example and I am looking forward to the day I can get it hung on a wall once more to be enjoyed. This entry was posted in British Army, Home Front, Illustration, WW1 on April 8, 2018 by hatchfive. This week we have neither a postcard nor a photograph for you, but rather a late nineteenth century etching. 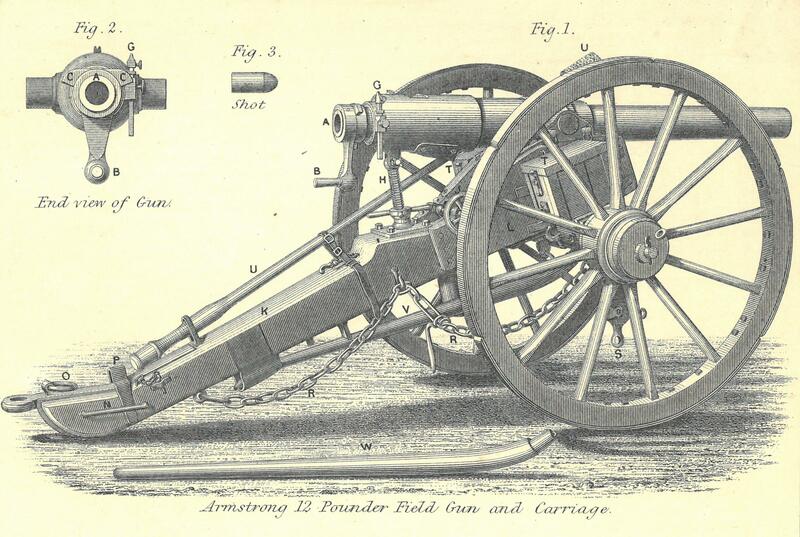 This etching depicts two pieces of contemporary ordnance: The upper illustration is an Armstrong 12 pounder field gun: This gun was introduced in 1859 and the gun incorporated some advanced features for its day. 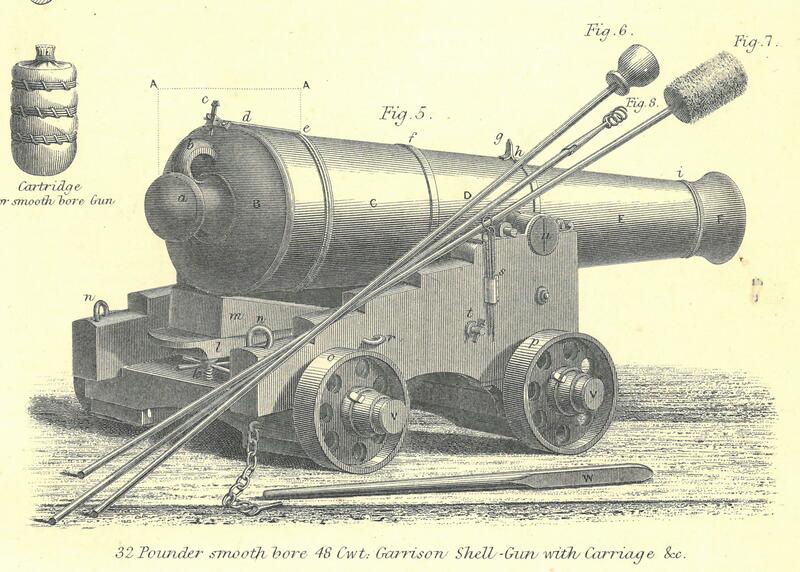 It was one of the first breech-loaders: shell and gunpowder propellant were loaded through the gunner’s end of the barrel, rather than through the muzzle as in previous guns, allowing a higher rate of fire. The shells were coated with lead, which engaged spiral grooves cut inside the barrel (“rifling”) and caused the shell to spin rapidly in flight and hence imparted far greater accuracy and range than previous guns. The lead coating effectively sealed the gap between shell and barrel and eliminated the wastage of propellant gases, previously known as “windage”, and hence only half the amount of gunpowder propellant as previous was required. The barrel was of wrought iron, “built up” of a tube with additional layers heated and then shrunk over it as they cooled. The result was a “pre-stressed” barrel: the interior of the barrel was under compression from the layers shrunk over it, so that the heat and pressure of firing did not stretch it. Hence the barrel was smaller and lighter than previous guns. 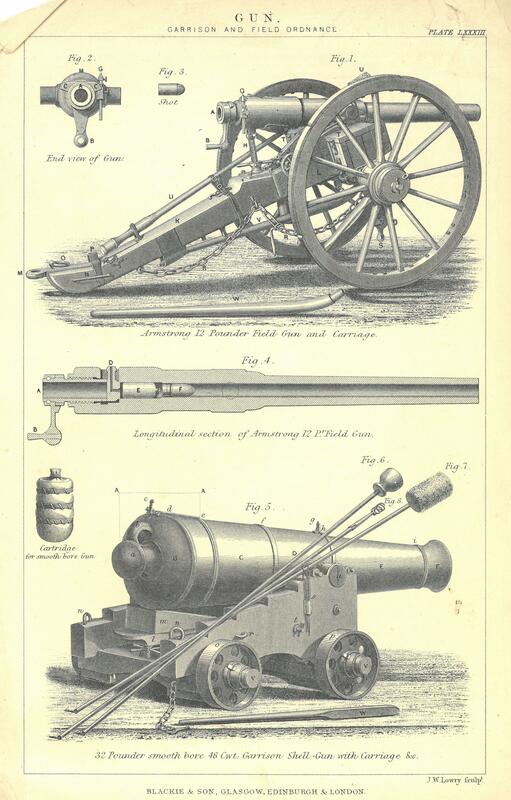 The lower illustration is of an older and more conventional 32 pounder, unrifled gun and carriage: This is a much older principle and similar to the cannon used during the Napoleonic era. The carriage and weight of this gun indicate it was designed to be emplaced on a fortification rather than used in the field. It has however been updated form early designs by having cast iron wheels to the carriage rather than wooden ones: It is also worth noting that the gun fires shell rather than solid shot. This design of gun carried on in service for heavy weapons for longer than the lighter field pieces. Early breach loaders were not always very safe at the breach end with heavy charges- metallurgy at the time being limited. The heavier and more solid breach end of a muzzle loader was far safer for heavy charges. This illustration comes, I suspect, from a contemporary book or journal. I would like to get this one framed up at some point as it would look rather nice on the wall but my ‘framing pile’ seems to just get larger! This entry was posted in British Army, Illustration, Pre WW1 on April 23, 2017 by hatchfive.